San Luis Obispo County Sheriff’s deputies arrested three men for gang related crimes in the North County on Wednesday. As part of a two-month investigation into crimes including shooting at vehicles and residences, assaults and property related crimes, deputies served search warrants in Paso Robles and Atascadero. Deputies arrested Jorge Cruz, 21, on suspicion of assault with force likely to cause great bodily injury with a gang enhancement, robbery and possession of metal knuckles; Juan Carlos Pacheco, 18, on suspicion of assault with force likely to cause great bodily injury with a gang enhancement; and Hector Ivan Lupercio-Chavez, 18, for a parole violation. 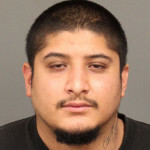 Officers booked Cruz into the San Luis Obispo County Jail with bail his set at $250,000. No information on Pacheco or Lupercio-Chavez status is currently available. Did a Morro Bay councilman game the system? Given the way a lot of you perceive and speak about illegal aliens and their offspring, and the way someone’s life can get hopeless real quick after a couple teenage mistakes, it’s no wonder these guys wind up acting the way they do. Society reflects the way the collective thinks. Nobody said anything about illegal aliens. The point was made that an 18 year old person was arrested for a parole violation. You get probation for a couple of teenage mistakes. You get parole for being convicted of a crime and spending time in prison. A two month investigation tells me these “teenagers” were up to a lot of “mischief” to require the allocation of these kind of resources to get them into custody. Kudos to the Sheriff’s Office for getting people who shoot guns at cars off our streets. I am sure if this poor misunderstood youth had shot MKaney’s car or worse hit a family member “accidentally” his tune would be different. Eighteen and already violating a parole?! WINNER! Three more of the hopeless members of society.